Koravi is a clan living in Maharashtra, Karnataka and Deccan region. Their mother tongue is Hindi or Tamil or Telugu or Marathi or Kannada. They are now spread throughout India. Presently they are Lingayats and other castes. After the decline of the Suryavanshi Kingdom, the surviving people migrated to different locations. Vijayasurtha (Prasanajit) and his family migrated to Saurashtra. He became a wealthy merchant. He had horses, bodyguards, workers and a big house. To sell his products, he visited various cities. One day he sailed very far away and because of high waves he arrived at an unidentified island. The island was huge and was covered with barren land and forest. He constructed a fort around the island with the help of his workers and divided the island into two different cities. He constructed a number of roads and houses. He transformed the barren island into beautiful islands. He lived in that island with his loved ones and named it as Gajapuri. People started living in that island and he was selected as the king of Gajapuri. After his death, his second son, Surathi became the king. This annoyed his eldest son, Marasjit. Surathi conquered a number of nearby islands such as Namadvipa, Shridvipa, Shatadvipa and Sansadvipa. To become a king, Marasjit devised a plan. He bribed the Chief of Navy to tell a lie. The Chief of Navy misinformed Surathi that Gajapuri is going to be attacked by the kingdom of Prajnethi. In order to make peace, Surathi went to the sea with his soldiers. But Surathi was killed on the way by his own Minister. Everybody in the army supported Marasjit. Therefore, Surathi’s wife, her kid and her relatives settled in Vadhachira. Centuries passed and medieval period began. Many foreign invaders attacked India and created several kingdoms. They were foreigners; therefore they tortured people and imposed taxes. Suryavanshi people were aware. Therefore they left Bhaironpur and settled in Vijayanagar. In the Vijayanagar Empire they became army officers and merchants. They were known as Ravivanshi. They adopted the Karnataka culture. Ravi clan people spread all over India. Some went to Maharastra, Andhra Pradesh and other places. Some of them arrived in Kor, Karnataka. Due to their capabilities, they became governors and military officers. The British entered Kor after hundreds of years. They tortured people who did not pay taxes. People migrated to different places with their leaders. In this family many were friends and some were enemies of British. Hucchappa I migrated to Hariyala with his family. His son, Lokappa I became a wealthy merchant. They left Hariyala and settled in Hubballi (Hubli). The Kushan Empire was a syncretic empire, formed by Yuezhi, in the Bactrian territories in the early 1st century. Under the rule of the Kushans, northwest India and adjoining regions participated both in seagoing trade and in commerce along the Silk Road to China. The name Kushan derives from the Chinese term Guishang, used in historical writings to describe one branch of the Yuezhi a loose confederation of Indo-European people who had been living in northwestern China until they were driven west by another group, the Xiongnu, in 176–160 B.C. The Yuezhi reached Bactria around 135 B.C. Kujula Kadphises united the disparate tribes in the first century B.C. Gradually wresting control of the area from the Scytho-Parthians, the Yuezhi moved south into the northwest Indian region traditionally known as Gandhara and established a capital near Kabul. They had learned to use a form of the Greek alphabet, and Kujula’s son was the first Indian ruler to strike gold coins in imitation of the Roman aureus exchanged along the caravan routes. 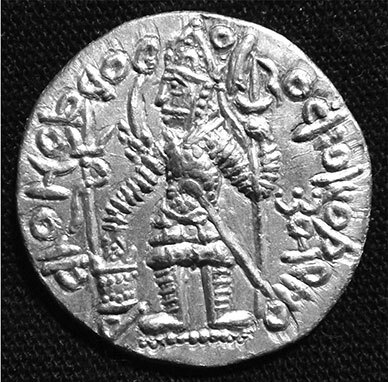 The rule of Kanishka, the third Kushan emperor who flourished from the late first to the early/mid-second century A.D., was administered from two capitals: Purushapura (now Peshawar) near the Khyber Pass, and Mathura in northern India. Under Kanishka’s rule, at the height of the dynasty, Kushan controlled a large territory ranging from the Aral Sea through areas that include present-day Uzbekistan, Afghanistan, and Pakistan into northern India as far east as Benares and as far south as Sanchi. It was also a period of great wealth marked by extensive mercantile activities and a flourishing of urban life, Buddhist thought, and the visual arts. The Gandhara region at the core of the Kushan empire was home to a multiethnic society tolerant of religious differences. Desirable for its strategic location, with direct access to the overland silk routes and links to the ports on the Arabian Sea, Gandhara had suffered many conquests and had been ruled by the Mauryans, Alexander the Great (327/26–325/24 B.C. ), his Indo-Greek successors and a combination of Scythians and Parthians . The melding of peoples produced an eclectic culture, vividly expressed in the visual arts produced during the Kushan period. Themes derived from Greek and Roman mythologies were common initially, while later, Buddhist imagery dominated: some of the first representations of the Buddha in human form date to the Kushan era, as do the earliest depictions of bodhisattvas. Sanskrit literature began to develop during the Kushan period. In this respect, Asvaghosha who was patronized by Kanishka, played a significant role. His works, Buddhacarita and Sariputra Karanam, opened a new horizon in the field of Sanskrit literature. It is believed that Asvaghosha laid the foundation of ancient Indian drama which was later developed by such luminaries as Kalidasa, Shudraka, and Bhasha etc.